The Geo Trade Blog: Heat Energy– is solar power the missing link in renewable energy? Heat Energy– is solar power the missing link in renewable energy? Heat dominates industrial energy consumption. In the UK alone 76 pc of industrial energy consumption is heat. Few things can be manufactured without heat. The importance of heat in total energy consumption sharply contrasts efforts to green the energy infrastructure. European and US policy is largely aimed at renewable electricity production using wind turbines and solar panels. But while it may be fine to convert electricity into heat for domestic use, such as electric heaters or electric cookers, it is also very inefficient to do so. It is often assumed that our energy problems are solved when renewables reach 'grid parity' - the point at which they can generate electricity for the same price as fossil fuels. But to truly compete with fossil fuels, renewable energy must also reach thermal (heat) parity. The missing element in European and US sustainable energy policy is a renewable source of thermal energy. The problem is that this technology is mostly used for the wrong purpose. In the 21st century, solar energy collected from solar thermal plants is still being converted into steam (via a steam boiler), which is then converted into electricity (via a steam turbine that drives an electric generator). The process is as inefficient as converting electricity into heat: two-thirds of energy gets lost when converted from steam to electricity. 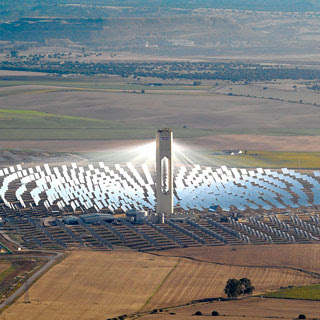 If solar thermal plants were used to generate heat instead of converting the heat collected into electricity, the technology could deliver much cheaper energy than it currently does. The crucial difference between solar thermal energy and other renewables producing electricity is that solar thermal energy actually starts with heat energy. Hence, in contrast with other renewables, the cost of heat energy is far lower than the cost of electricity, and so it may be able to compete with burning fossil fuels at the thermal level. The Geo-Trade Blog believes that policy makers in the US, Europe and Emerging Economies should explore further how solar heat energy could be applied directly to industry, without the intermediate step of generating electricity. Doha Round of World Trade – who needs it most?